UCI ophthalmologists pioneer zigzag incision technique that improves outcome of laser-assisted corneal transplantation. For most of the 40,000 Americans who undergo corneal transplants each year, recovery is uncomfortable and slow, sometimes taking as long as six months. Even then, clear vision may not be fully restored. But ophthalmologists with UC Irvine’s Gavin Herbert Eye Institute have developed a surgical technique that allows patients to heal faster and see better. By trading the traditional scalpel for a laser and using a zigzag incision pattern on the “front window” of the eye, Drs. Marjan Farid, Sumit Garg and Roger Steinert are revolutionizing corneal transplantation — in which a diseased or damaged cornea is replaced by donor tissue. Introduced by Steinert and his UCI colleagues and approved by the U.S. Food & Drug Administration in 2005, the procedure utilizes a femtosecond-pulsed laser. “We’ve seen lasers used reliably in countless Lasik procedures, and it makes sense that they be applied to corneal transplants,” says Garg, who joined the institute in July after completing a residency and fellowship at UCI. Studies on laser-assisted transplants have found that the treated area heals much faster — within three months — and may be as much as 10 times stronger than with conventional transplants. Still, a majority of corneal transplants are done the old-fashioned way, with a scalpel, and not everyone is a candidate for the laser procedure. To improve the transplanted cornea’s bond with the eye, the UCI team devised a more precise cutting pattern. 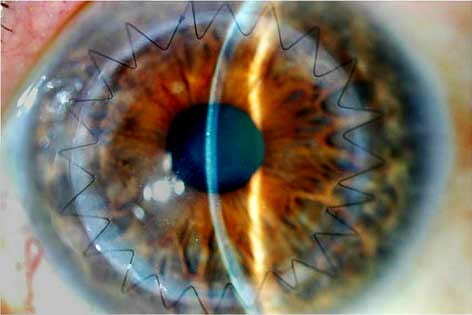 Instead of a straight incision, the laser makes zigzag slices around the patient’s eye and the donor cornea. The cuts interlock like puzzle pieces, so the new cornea fits in perfectly, and surgeons don’t need to stitch the eye as tightly. In the October issue of the journal Ophthalmology, Farid and colleagues showed that 81 percent of zigzag laser-assisted corneal transplant patients in a study had achieved 20/40 or better vision three months after surgery, compared with only 45 percent of people who’d undergone conventional transplants. The zigzag group also experienced faster recovery of vision and less astigmatism one month post-procedure than the other group. The Gavin Herbert Eye Institute is the only facility in Orange County offering laser-assisted corneal transplants. It’s part of UCI’s comprehensive effort to bring together researchers and clinicians in a single setting to study eye diseases, pioneer treatments and train tomorrow’s ophthalmologists.